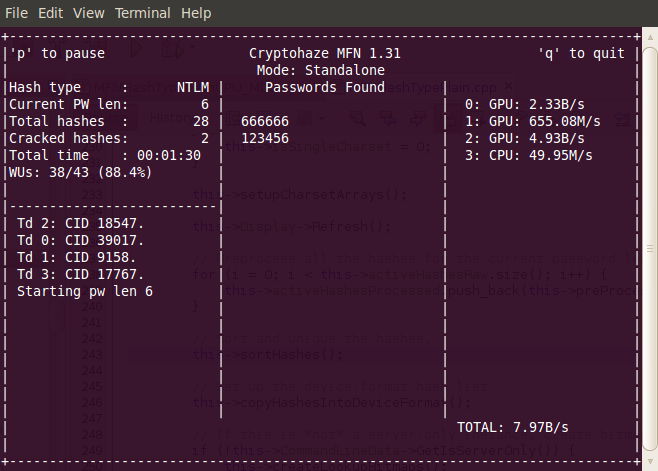 Cryptohaze Blog: Huh. That's... weird. Is it an OpenCL Multiforcer? Huh. That's... weird. Is it an OpenCL Multiforcer? That's weird. What mix of hardware could be generating these speeds? It couldn't possibly be an ATI 6970, an nVidia GTX580, an nVidia GTX260, and an i7 processor all working TOGETHER, could it? It is. And it's fast. And it's ready to beta for Linux. It only supports NTLM and MD5 right now, and if you have an ATI 6xxx series card, you probably want to add "--bfi_int" to the command line flags - it doesn't do it automatically yet. If you don't want it to use everything, and just want to test it on your ATI cards, add --nocuda and --nocpu (and likely --bfi_int) to the command line flags. If you're running a 7970, I haven't tested it on one yet, but you should be able to skip the --bfi_int flag and still get very good performance as the compiler does what it should. Which GPU is which in your list on screen shot? GPU 0: GTX580. GPU 1: GTX260. GPU 2: AMD 6970. CPU: Core i7.